Not a Diva is the hot new show on Mzansi Magic that sees local celebs getting down and dirty – while proving there’s more to them than their glamorous lives. SA’s hot new show is brought to you by 1st for Women who offer insurance specifically designed for women. The show includes personali­ties doing adrenaline-pumping activities and attempt to overcome their greatest fears. Be inspired by women living life to the fullest! If you love being fabulous but you’re not afraid to embrace that outdoor life, 1st for Women wants to hook you up – just in case you still haven’t bought tickets to the much-antici­pated music event of the year. Ditch your heels for glamping in an enchanting fo­rest while the best local and international acts perform live. Sound like something you’d en­joy? 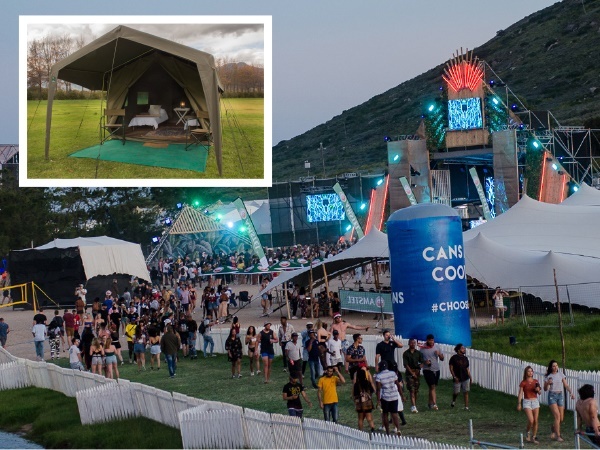 We’re giving away a three-day festival pass to Rocking the Daisies – including a two-night stay with five-star accommodation and daily breakfast. Don’t miss out! Tune in to Not a Diva on Mzansi Magic every Thursday at 9.30pm! Accommodation includes: 2 beds, pillows, sheets, electric blankets, duvet, extra blankets, towels, carpet, ground sheet, a table, dustbin, chairs, plug point and light. 1. Simply tell us who is the sponsor of Not a Diva. 2. To enter go to Channel24 or click here. COMPETITION RULES, TERMS AND CONDITIONS The competition runs from 19 April to midnight on 31 July 2019. You may enter as many times as you like. *Each SMS costs R1,50. You must be the owner of the cellphone or have permission from the owner of the cellphone to use it to enter the competition. Staff of Media24, the prize sponsor and their families may not enter. You have to send the correct answer to the question to stand a chance to win. Winner must be over 18 years old. Prize does not include transport to and from the event and meals not specified. Winners will be chosen by random draw and will be notified telephonically. If a winner can’t be reached within three calls during business hours, a new winner will be chosen. Media24 and the prize sponsor take no responsibility for any damage caused by entering or taking part in this competition. Prizes are non-transferable and may not be exchanged for another prize or for cash. By ente­ring this competition you agree that Media24 and the sponsor may occasionally contact you regarding promotions and other marketing that may be relevant to you, subject to your right to decline such promotions and marketing.